Although it would be nice to spend the entire winter in a sleeping bag made of silk, that could be very expensive, and of course, we humans cannot enter such a prolonged period of sleep. But what about other creatures? Creatures that can simply “make their own” silk sleeping bags? 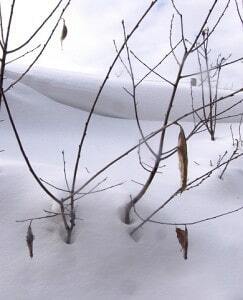 There are close to a dozen species of “Saturniidae” (silkmoths) native to the Kawarthas, and although a few of these are earth-pupators – those that as late stage larvae, tunnel into the soil where they transform into a naked pupa to spend the winter, the larvae of the other species spin some kind of silken cocoon prior to pupation. Some of these fall to the ground with the autumn leaves, but a few species fix their “sleeping bags” to the branches of trees before spinning the rest of the structure entirely around themselves. During a walk down a country road north of Havelock on February 12, 2014, Jane and I spotted no less than 13 cocoons of the Promethea Moth as they hung from the branches of, (and each wrapped in a leaf of), ash and cherry, (two favorite larval host trees of the species). They were all along about a 200 metre section of the road, and although we checked each of them with a little “rattle test”, it appeared that only four of them contained living pupae that will likely emerge as adult moths – during the first week of June in The Kawarthas, if spring temperatures are average. Unlike most other local species of silkmoths, the promethea is interesting in that the females emit their pheromones in the mid-afternoon, and the males are drawn in from great distances, until she breeds with one of them. 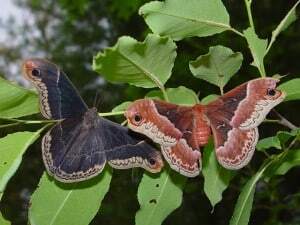 This makes it rather easy to witness, whereas if you hoped to see the same display with one of the larger species like Cecropia, Polyphemus, or Luna, you would have to be watching after dark because females of those species “call” the males in late at night. If you are fortunate enough to find a Promethea cocoon in one of the trees in your yard, keep an eye on it in late May and early June. The moths emerge from the cocoons in the morning, usually between 8:00 am and 11:00 am. They will pop out the top, and then simply hang onto the side of the cocoon while their wings unfurl, and “inflate” to full size and stiffen up. That process can take from one to two hours to complete. Then, the moth will quietly hang on into the afternoon. If it is a female, at between 2:00 pm and 4:00 pm, you may notice that something has dropped down from her hind end. That is her ‘scenting” apparatus. Look soon then, for the smaller and darker male to come flying in. If the first one to get there has no competition, the mating will take place quickly. The two will usually hang joined together until just after dark. Then, they separate, and the female goes off to lay her eggs on the underside of the leaves of favorite host trees. If it is a male that has climbed out of your cocoon, he will simply fly off in the afternoon with the first scent of a female, (who could even be several kms away!) These moth have no feeding parts as adults, so don`t expect to see them flitting around the flowers like butterflies. 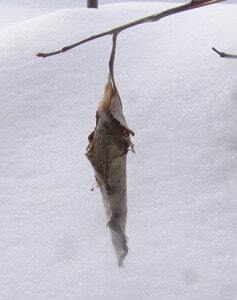 Promethea moth cocoons however, can hang for several years on a branch, and long after the moth has emerged from it. If you want to check to see if the cocoon in your tree is even going to produce a moth in the spring, here is a simple test to tell what is likely inside, without harming or removing the cocoon from the branch. Just simply lift the cocoon a little, causing a little slack in the thin upper part that it hangs from. Shake it gently from side to side while you listen. – if it feels rather heavy, and there is a dull thud when you shake it, it very likely holds a living pupa, and should be watched in the spring for an emerging moth. – if it feels like it has a little weight to it, but makes a very dry “rattling” sound when shaken, it most likely contains a dried up pupae, or even a caterpillar that died and dried up after spinning the cocoon, and before it would have become a pupae. 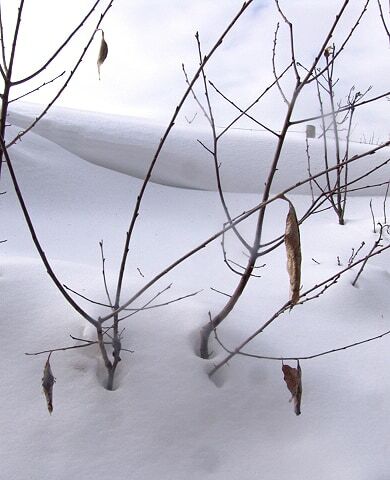 Either way, not really worth wasting time watching for an emergence in late spring. – if the cocoon seems to have some weight to it, but makes absolutely no sound at all, it no doubt is filled with tightly-packed pupae of parasitic wasps or flies, which would have come from eggs layed on the caterpillar long before it spun it`s cocoon. You can watch for these to emerge if you like, but the timing is much harder to predict than that of the moth as described above. – if you give a very light-weight cocoon a little shake, and there is no sound, or perhaps only a very quiet light papery sound, it is likely that there once was a moth, but it had already emerged one or more years before. The papery sound that you may hear inside, is the pupal shell from which the adult moth had broken free of just prior to tearing through the silk valve at the top of the cocoon when it had emerged. I will keep my eye out for Cecropia cocoons, and report on those if I see any. They are much bigger than these, which average four to six cms by one to two centimetres in size.